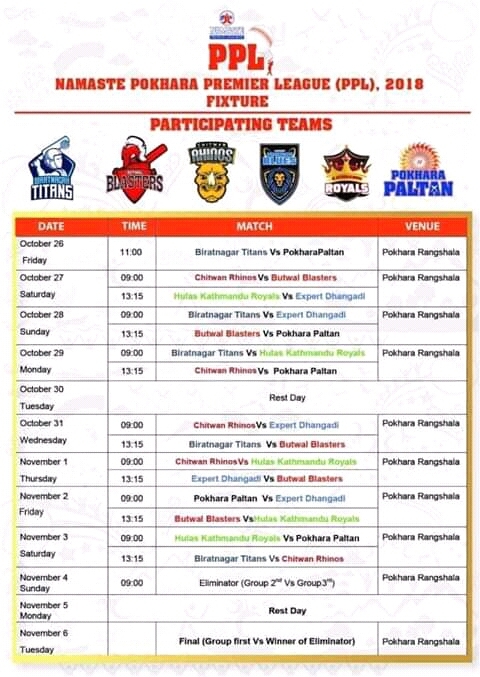 Pokhara Premier League’s (PPL) fixture has been released as Biratnagar Titans will meet Pokhara Paltan in the opening match of the tournament. Pokhara Premier League is around the corner as we are just 11 days away from the commencement. 6 teams will participate in this tournament which is going to be held in Pokhara. Every teams will face each other once in the league stage in 12-days long competition. Top side will directly qualify for final whereas second and third sides will meet Eliminator. Winner of Eliminator will qualify for the final. Barring opening, eliminator and final matches, we will have double-headers everyday. First match of double-headers will start from 9:00am local time whereas second one will take place from 1:15pm. After completion of formal opening ceremony, Biratnagar Titans and Pokhara Paltan will face each in the opening day with match to start from 11:00am. Previous articleThe Diversified BMW CUP 2018: A tourney that is offering a lot.